What is the Chin Dip/ VKR? The Inspire Fitness Chin Dip is a multi-use body weight trainer that features a variety of body weight exercise capabilities including; sit up, chin up, leg raise and push up stations. Allowing the user a dynamic body weight exercise routine within a small yet exceptionally robust housing, the Chin Dip by Inspire Fitness is crafted of heavy gauge steel and capable of taking a maximum user weight of 227kg. How does the Chin Dip work? Featuring a variety of body weight resistance options and the ability to be completely upgraded to the PT-1, the Chin Dip by Inspire Fitness offers a host of functional exercises within a small frame just over 2 metres in height. 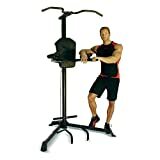 Featuring a maintenance free coating and tubular steel fittings, the Chin Dip is capable of exercises such as chin ups, push ups, dips, leg raises, muscle ups, windscreen wipers and a variety of others which make the Chin Dip one of the most accessible body weight functional trainers on the market today. Frame: Heavy-duty 2″x4″ oval and 3″ round gauge tubular steel.